Plumbing & HVAC Expertise for Your Home or Business. How Can We Help You Today? 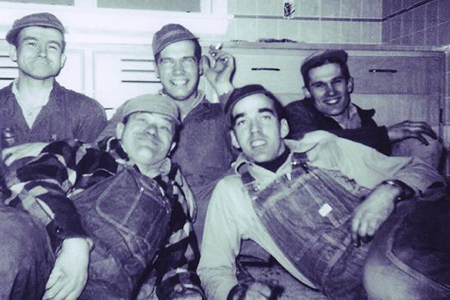 Photo taken on a lunch break during construction of Pleasant View Retirement Community in 1954. Pictured are Lloyd Haldeman, Jay Haldeman, Ed Haldeman (back row left to right) and John Heisey (front right) as well as Webber Electric employee Galen Shelly (front left). Since 1939, Haldeman Mechanical has brought peace of mind to homeowners and business owners in Lancaster, PA.
With 24/7 emergency services, preventative maintenance plans, and caring technicians, Haldeman Mechanical is the champion in plumbing and heating/cooling services for local homeowners and businesses. Signing up for an annual service plan is a great way to ensure your heating and cooling systems or water conditioning equipment are working as efficiently as possible.